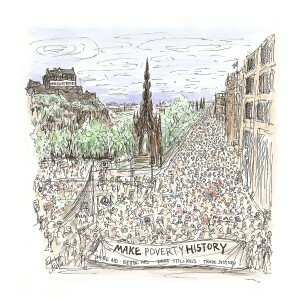 Jubilee Scotland campaign against unjust and unpayable global debt. The payment of debts from poor to rich countries diverts vital funds away from the needs of citizens and so inhibits efforts to eliminate poverty and suffering around the world. We want to see millions of people lift themselves out of poverty as governments in poor countries stop paying back these debts and invest more in education, healthcare and livelihoods. ability to afford its key priorities, such as health, welfare and education. If you have a question that hasn’t been answered here, please contact us. There are loads of ways you can get involved with our campaigns. To order resources and help promote our campaigns and learn more about the debt crisis click here. Sign up to our e-updates and keep in touch with how our campaigns are going and events in your area. If you are part of a group or organisation you can become a member of Jubilee Scotland and contribute to our work.